THIS PAINTING WAS MOST LIKELY STARTED WHEN THE CLUB WAS SHUTTING DOWN AND FINISHED IN 1941. NOTICE ALL THE PATRONS ARE WHITE. Preston was a member the Society of Independent Artists. He is listed in Who Was Who in American Art and in the exhibition records of the Society of Independent Artists. There is no further information about him after 1941; the war may very well interrupted his career as it did many artists. The Cotton Club was a New York City night club located first in the Harlem neighborhood and then in the midtown Theater District. The club operated from 1923 to 1940, most notably during America's Prohibition Era. 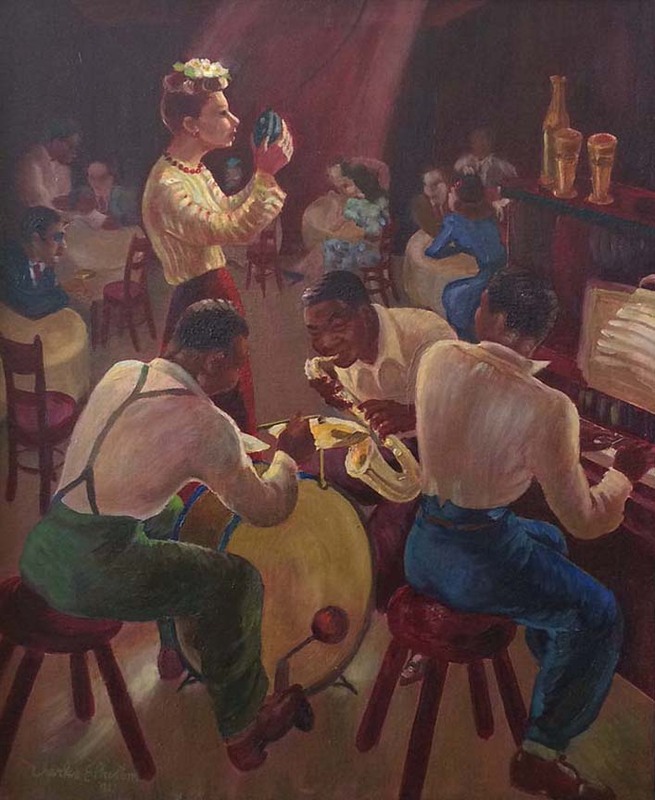 The club was a whites-only establishment even though it featured many of the best black entertainers and jazz musicians of the era including Lena Horne, Fletcher Henderson, Duke Ellington, Adelaide Hall, Count Basie, Bessie Smith, Cab Calloway, The Nicholas Brothers, Lottie Gee, Ella Fitzgerald, Fats Waller, Louis Armstrong, Nat King Cole, Billie Holiday, and Ethel Waters. During its heyday, the Cotton Club served as a hip meeting spot featuring regular "Celebrity Nights" on Sundays which featured celebrity guests such as Jimmy Durante, George Gershwin, Sophie Tucker, Paul Robeson, Al Jolson, Mae West, Richard Rodgers, Irving Berlin, Eddie Cantor, Fanny Brice, Langston Hughes, Judy Garland, Moss Hart, and Mayor Jimmy Walker, among others.